'Indulge' (Roger Nelson, R. 1992). Seedling# RN 85-115AG. TB, 32-33" (81-84 cm), Early midseason bloom. Standards medium orchid (RHS 80C), deeper (near 80A) veins and midrib; falls deeper rose orchid (79C) at edge to orchid (80B) near center, medium violet blue (87C) area at end of beard, yellow-infused wine brown thumbprint at hafts; beards gold orange (23A), tipped bright gold orange (17B); ruffled, laced; sweet fragrance. 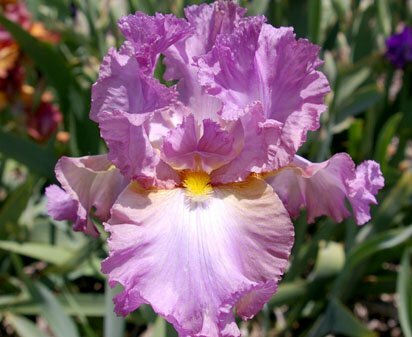 'High Falutin' X Seedling# RN 83-85F: ('Warm Embrace' x ('Blushing Pink' x 'Glory Bound')). Iris Country 1993. From AIS Bulletin #289 April 1993 Introducing INDULGE (R. Nelson '93). TB, 32". Frothy, laced and ruffled smoky orchid with strong wine brown thumbprints and a blue haze below the bright gold-orange beards. Strong grower and reliable bloomer with 7-9 buds. $35.00. Iris Country. JPG IndulgeSI.JPG manage 266 K 16 Apr 2019 - 21:56 Main.TLaurin Photo by Sandy Ives.